Dimensions: 24" x 68" x .70"
Be comfortable wherever you go with The Stimulite Travel Pillow by Supracor. Soft and supportive, The Stimulite Travel Pillow cradles your head and neck while circulating air and evaporating moisture. So light and compressible, it can be stuffed into a briefcase or tote purse. The Supracor Stimulite Travel Pillow features a softer and firmer honeycomb side for individual preferences. 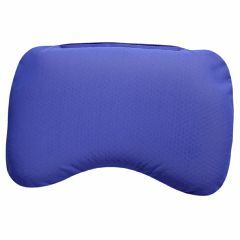 The Stimulite® Travel Pillow with Blue Cover can be used with the Stimulite Wellness Mat. Hi customer service, According to the above description, the dimensions are 24" x 68" x .70". For a travel pillow, this seems wrong. Can you please verify?